Pallet rack is now a widely used material handling storage aid system giving users ample opportunity to maximize the inside available spaces. Although there are varieties of pallet racks available in the market, Los Angeles pallet rack occupies a dominant position in the global market for the beautiful finishing and high-capacity storage system for the heaviest pallet loads. Just a Rack specializes in offering superior quality Los Angeles pallet rack. Our common and customized Los Angeles pallet racks are designed to increase the storage density of the stored goods. The product cost varies, depending on the quality of the metal used and storage density. 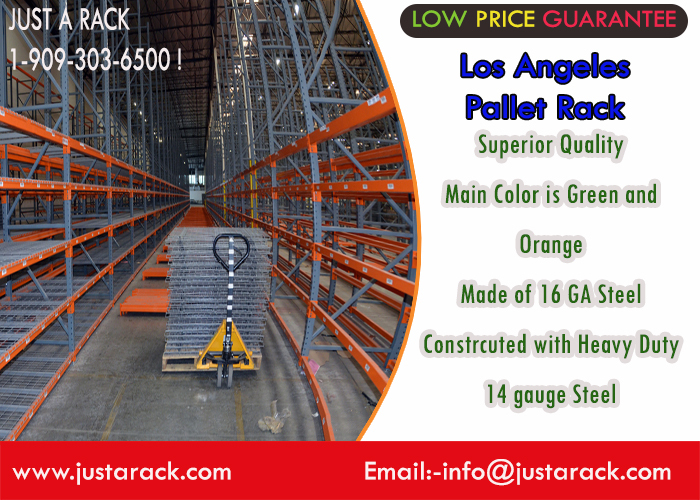 Available in two main colors green and orange, these Los Angeles pallet racks are made of 16GA steel. No tools are required to assemble it at your desired places. It offers 3" x 3" standard column, 5" x 8" foot plate and 4"or 5" step load beam. Row spacers are used to connect rows of pallet rack (back to back). As the name suggests, it is designed for giving heavy duty. Made of 14GA steel throughout, our heavy duty pallet racks are supplied with 3" x 3" standard column, 5" x 8" foot plate and 4"or 5" step load beam. Like regular duty upright, our heavy duty pallet racks requires no tools to assemble. It is delivered with two main colors- green and orange. Constructed with heavy duty 14 gauge steel, Pallet Rack Upright features 3" wide x 1-5/8" deep columns, 5" x 3 3/8" foot plate. Like other pallet racks, the Pallet Rack Upright is available in green and orange color. Our selective racking systems offer an easy and immediate access to every pallet available in the system. It allows you to compromise with storage density and product selectivity. To ensure a quick ship, we have many warehouses in strategic locations of Los Angeles city. Quality products, reasonable rates and satisfactory customer services are the key lines of our services. Approach us with your common and customized needs. We are at your service and dedicated to meeting your needs at affordable prices.